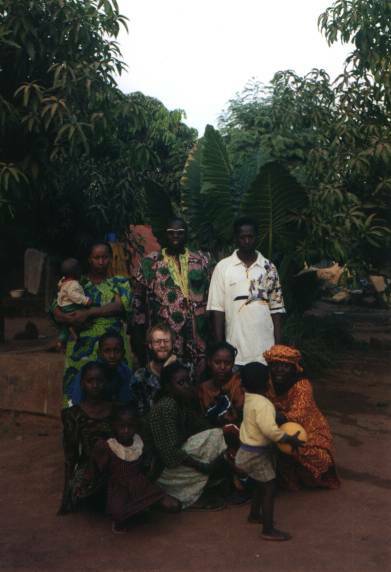 Some relatives of Dramé (shades), and me (white) in their yard in Sikasso. They were gathered for a family funeral ceremony. Grief was shown mainly around personal condolences and tears in the private, darkened widow's room. But the maraboud's benedictions and the griot's sung-spoken eulogy during the subsequent feast lent the atmosphere of a great send-off. Bandiagara. "Le vieux", "The Old Man" standing in our living room. Moctar Tall is Madani's son, here clean and well-dressed for the photograph. I was given the same name as he has; we both shared the name of the village chief, derived from the name of the prophet Mohammed. Bandiagara. Aba lived in the Tall family concession, part of the family that shared the yard "because of God". Their residence here was a kindness from a brother of Gogo's husband to them. Bandiagara. 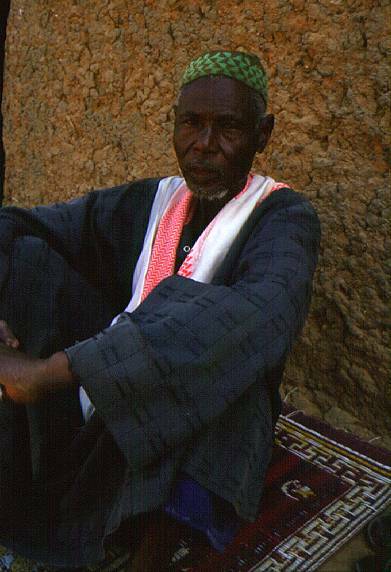 Mah Diabaté, "Djeli Mah", is a griotte, a singer-storyteller, who performed in Bandiagara. She and her band spent an afternoon getting ready for the show, eating, and chatting in our concession. Part of the show was for people to get up and dance with her, and contribute to the band. Bandiagara. Ousmane Ouologem lived across the street from us in the same concession as Fanta's family. I did not learn enough Dogon to earn his trust more than to take this picture, which his mother allowed. His necklace and leather-bound charms include Islamic and animist protections. His melancholy expression and swollen feet are classic signs of kwashiorkor, "wet" malnutrition: caused by protein deficiency. Bandiagara. 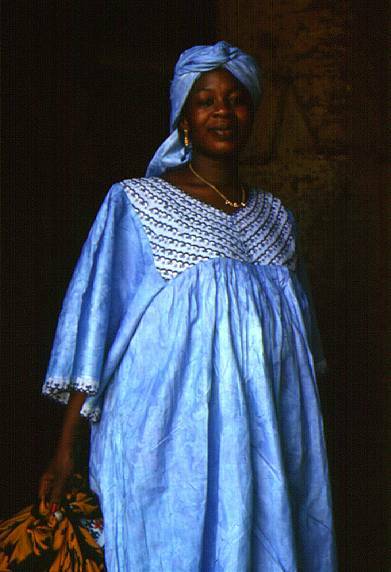 Anna, a sister of Madani, nine months pregnant and dressed in her best boubou. She came to stay in Bandiagara to have the baby, while her husband's next military stationing was made final. 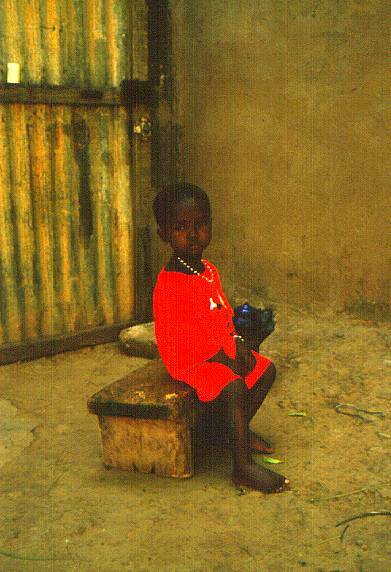 The nearest medical facility to her village was a ten-kilometre moped ride. She's carrying a meal Gogo prepared for some visiting relatives in town. (Later news in a letter: the baby boy was baptised "Madani"). Bandiagara. 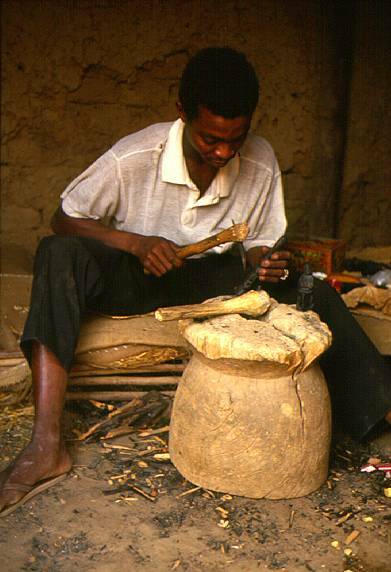 Ibrahim N'Daye, also known as Ibou, carving ebony. His tools include small wood and iron adzes, discarded dentist's implements and jackknives. On the over-turned tree trunk to Ibou's left is a carving he made for me to give to my father. It is of the late, great Bassoumanna Sikosso, Mali's national griot: "the lion of Mali". Nohma weaves cotton strands into thread, to be woven in turn into clothing and blankets. 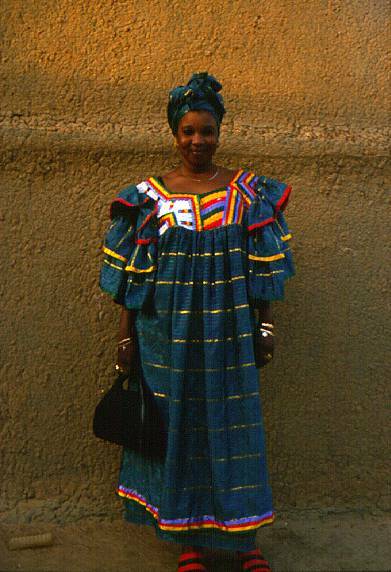 Cotton is a major crop in Mali, and is an important feature of cultural identity of the Dogon of the fifth region. 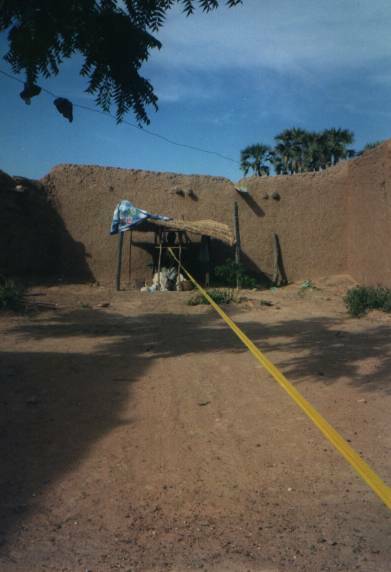 The Dogon liken their language and culture to an interconnected net of knots and strands: "dogo so salukobou." Cotton is a long plant fibre, well-suited to weaving, and serves to protect each Dogon for a lifetime: from a new-born's swaddling to the funeral shroud. Cotton brings unity and order, braids together races, peoples, sexes.